SOLON, Louis Marc Emmanuel (1835-1913), pottery artist, Stoke upon Trent. Louis Marc Emmanuel Solon was born in Montauban, Tarn et Garonne, France, in 1835. Ill health	prevented his studying law as expected and he attended the Atelier of Lecoq de Boisbaudrant, Paris. Some of his etchings were published while he was at Lecoq's	studio and this led to his joining the Sevres Pottery, where he experimented with the pate-sur-pate process. A vase thus decorated was the Sevres entry in the 1867	International Exhibition. Solon moved to Minton's, Stoke upon Trent, just before the Prussians besieged	Paris in 1870. There he was encouraged by Colin Minton Campbell to continue with	his pate-sur-pate work. He and the assistants he trained produced many items which	are now acknowledged masterpieces, including Queen Victoria's Jubilee Vase. Solon's decoration has been described as 'a curious blend of fantasy, Renaissance and	Classical styles and discreet eroticism'. assembled a large collection of pottery, especially salt-glaze ware. He wrote a	number of books on pottery and amassed a collection of works on ceramic history of	over 3,500 volumes. His published works include 'A Brief Account of Pate-sur-Pate' and 'The Art of the Old English Potter'. TO COLIN MINTON CAMPBELL ESQ. of many favours received at your hands. About 1873 Solon married Maria, daughter of Leon Arnoux, the art director of	Minton's, and they had eight sons and one daughter. The family lived at No. 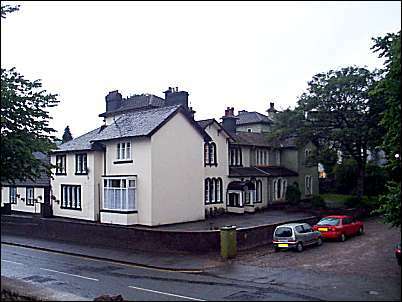 1, The	Villas, Stoke upon Trent, where he died in June 1913. This house (and others) in the Villas are listed buildings. 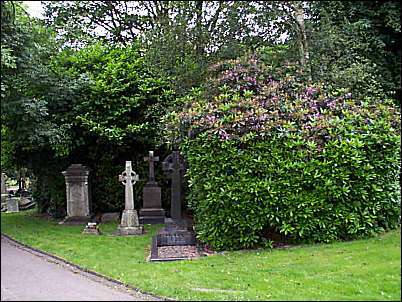 He and his wife Maria, who died	in October 1910, were buried in Hartshill cemetery. As Roman Catholics they were buried in the 1st Class RC area of the cemetery. Colin Minton Campbell's wife, Louisa, converted to Catholicism and so she was not buried in the family vault but here in this small Roman Catholic 1st class area. His son Leon Victor Solon was art	director of Minton's 1900-9. Solon had sold his collection of pottery at a sale held in the salerooms of Charles Butters in Hanley from 26th to 28th November 1912, and after his death his library was	sold to the Central School of Science and Technology, later the North Staffs. Technical College and the North Staffs. Polytechnic. (The collection is now, 2000, in the archive library, Hanley). The pate-sur-pate process for which Solon is chiefly remembered, involved laying	slip on to a Parian clay body which had been coloured by metallic oxides. The slip is	applied in successive coats. Then the piece is scraped, smoothed, carved and incised	by iron chisels. Solon often spent 50 hours or more on the decoration of an individual	piece. SOURCES: P Atterbury, The Story of Minton; Census 1881; The Connoisseur vol. xxxv, Jan.-April 1913; G.	Godden, Victorian Porcelain; Pottery and Class Magazine March 1951; Pottery Gazette 1 March	1906; Staffs. Sentinel 23 June1913;	The Art of the Old English Potter; People of the Potteries; A Dobraszczyc notes.